So, you want to record music. Sure, you could just simply get an adapter for your guitar/mic cable and plug your instrument straight into the audio card of your computer. However, the sound quality will be mediocre at best, there will most definitely be some lag, and the overall experience will be pretty tedious. That’s where an audio interface steps in. So, whether you’re an absolute beginner looking for a budget/value model, a more advanced audio engineer, or a professional looking for the best interface on the market, you’ve come to the right place. In this article, we will go over the basics, the most important features you should look for, as well as review some of the best audio interfaces money can buy. Sit back, relax, and let’s get right into it! If you know which type of audio interface you want, jump straight to our picks. Or, if you don’t know where to start, jump to our audio interface buying guide section. With a capacity of up to two instruments from a top-quality brand, it is the perfect choice for a beginner or small home studio. Focusrite is a brand that is well known for their high-quality studio equipment, with models ranging from entry level to professional. Their Scarlett 2i2 audio interface offers an easy and straightforward approach to recording audio for everyone looking to make their own home studio. Being on a relatively tight budget doesn’t mean you have to sacrifice quality and productivity, and the Scarlett 2i2 clearly shows that with its specs and features. Starting with the compact form factor and small footprint, you can fit the Scarlett pretty much anywhere. Although it’s small, it definitely can pack quite a punch. The front panel hosts 2 combined TRS/XLR inputs, which is more than enough for recording 2 instruments, or a vocal and an instrument simultaneously. Each of the inputs has a separate switch for toggling between mic/instrument mode, as well as a gain knob for on the fly adjustments. Besides that, there is a switch for turning direct monitor on and off, a big monitor level knob, as well as a headphone output with its dedicated level control. The back of the device is as simple as it can get. A USB connection in the middle and stereo outputs on the right, for connecting the device to your speakers. It’s pretty obvious that the Scarlett 2i2 focuses on home studio use and musicians/audio engineers who really don’t need much more than a compact and reliable audio interface. However, don’t think that you’ll be missing out on the quality and overall user experience. This interface offers 24bit/96kHz recordings, which, when mixed properly, sound pretty darn amazing. Sure, comparing the performance of this device to models that are much more expensive yields in a noticeable difference in audio quality, but when it comes to the budget price range, the Scarlett 2i2 is a clear winner. ​So, who is the Scarlett 2i2 for, and should you get it? You’ll be getting a pretty solid audio interface. It sounds great, feels solid and durable, and most importantly, it’s very easy and straightforward to use. Whether you’re an aspiring audio engineer, a musician who wants to record songs, or even a more advanced studio tech that needs a small device that’s travel-ready, definitely check the Focusrite Scarlett 2i2 out. At half the price of the 2i2, the Behringer will give the beginner everything they need to get started. Keep in mind that you will need to upgrade pretty quickly if you are serious. The U-Phoria by Behringer is a great alternative to the previously mentioned Focusrite Scarlett 2i2. For half the price, you’ll be getting that well known Behringer quality, both in terms of build and the actual audio. While the price difference is relatively big, I will still try to compare it to the Scarlett 2i2, as there are not many other audio interfaces this cheap are worth mentioning and comparing to. This device is slightly smaller than the Scarlett, making it a perfect choice for anyone with an already crammed desk. You can even take the U-Phoria with you when you travel, as it’s completely powered through the USB connection, and is very well built. The front interface offers a similar experience to the one you’d get with the Scarlett 2i2. Two combined TRS/XLR inputs on the left alongside separate line/instrument and pad toggle buttons, as well as gain controls. What’s really neat is that there are two LEDs for each channel as well, letting you know if the channel is active or not and whether they’re clipping. The right-hand side of the panel sports output and headphone level knobs, as well as a toggle button for controlling the direct monitor feature. The back of the U-Phoria is pretty minimalistic, with stereo outputs, USB connection, and a toggle for the +48V for using the device with condenser microphones. So, what’s the difference between the U-Phoria and the Scarlett 2i2? The main difference is in the actual audio quality of the recordings. The U-Phoria utilizes 2 Midas microphone preamps, one for each channel, giving this interface a noticeable advantage. The specs sheet also makes the difference pretty clear. You’re getting 24bit/192kHz recordings, which is not only noticeable on paper, but in use as well. ​So, is the U-Phoria worth getting? At this price point, definitely. The audio quality is above average, and the user experience is straightforward and simple. 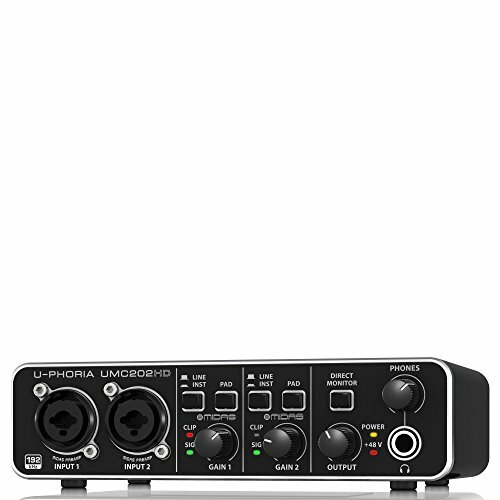 Whether you need an audio interface for everyday use, or just want to be able to record some tunes from time to time, the U-Phoria by Behringer is a safe bet. 8 inputs and top quality engineering make the Scarlett 18i20 our top pick. If you don't need the top of the line, but have a large array of instruments, this interface is perfect. We’ve seen that the good folks at Focusrite know how to cater the needs of a beginner audio engineer with a tight budget. The Scarlett 18i20, with its numerous inputs and outputs, and overall amazing performance, focuses on more advanced studio needs. As it’s pretty clear when you look at the picture, this model is what is called a rack interface. Though it’s pretty short, the width makes it kind of impractical for desk use, so consider getting an actual rack to mount it on. The front panel, while pretty long, is extensive, yet simple enough so you don’t get lost in the buttons and knobs. Only 2 of the 8 combined analog inputs are on the front, while the rest are tucked away in the back. The controls cover level for all of the analog channels, with separate 48V boost for either the first or last 4 channels, when they are used with condenser microphones. On the right-hand side of the front panel, there is a neat LED visualizer, letting you know the levels of the individual channels in dB, so you can easily tell if any one of them is clipping or not, without having to actually look at your computer screen. The rest of the controls include dim and mute buttons, a monitor level knob, as well as 2 headphone outputs, each with its own level control. The real fun, however, starts in the back! Besides the 3-8 channel inputs, there are 10 line outputs, as well as MIDI in and out. The optical connection allows you to connect a device with up to 8 individual channels, and with S/PDIF, you basically have the option of connecting a total of 18 devices! As you would probably expect, the sound quality doesn’t fall behind. With 24bit/192kHz and super low latency, the 18i20 easily manages all the input devices you throw at it at super high resolution and studio quality. ​Whether you run an audio studio, or simply need a mean device to record your band in high-quality audio, the Scarlett 18i20 with its MIDI, optical, and analog input capabilities and very useful software pack will make those recording sessions a walk in the park! DAW included and everything you need for an advanced studio. The PreSonus is a perfect fit if you can put it in your budget. After reading about Focusrite Scarlett 18i20, you’d think that there’s hardly a better option than it, at least in that or the neighboring price range. However, the Studio 192 by PreSonus offers a slightly different approach which will definitely appeal to at least a portion of the reading audience. The front panel while a bit more simple, definitely still gives you full control over the many inputs and outputs this device can handle. As expected, there are 2 easy to reach combined inputs on the left, followed by a small screen which gives you more info about the currently selected channel or preset. Going further to the right side, there is an array of LEDs that show you the exact level of each individual channel, and whether they’re clipping or not. A big yet very precise dial is used for setting the main level, and the smaller two knobs are used for adjusting the individual headphone levels for each of the 2 outputs. As it’s common for rack-mounted audio interfaces, most of the inputs and outputs are located on the back of the device. You’ve got 6 more combined analog inputs, 8 analog outputs, as well as a pair of optical inputs and outputs as well. Other connections are covered via S/PDIF as well as a USB 3.0 connection that goes to your computer (Windows or Mac). With that many inputs and outputs, you can basically record anything you’d want, except for MIDI devices, which are, sadly, not supported by the Studio 192. What really makes this device stand out are 8 XMAX preamps which are remotely controllable, and feature PreSonus AI Fat Channel Processing. This not only gives the Studio 192 very high audio quality but allows you to enable effects for monitoring as well. The included DAW and software packs make using this audio interface a very pleasant experience, whether it’s with the included DAW or any other that you prefer. ​So, if you need a powerful and capable audio interface for your studio, no matter how many channels you need, the Studio 192 by PreSonus will most likely meet the most of your expectations. Everything you could possible need in terms of technology, inputs, and ease of use. You can't go wrong with the PreSonus Studio 192. When it comes to professional audio gear, you’re basically looking for a couple of things. Great audio and build quality, reliability, and a constant and pleasant workflow. Let’s see how exactly the Ensemble from Apogee ticks all of those boxes! As with most Apple-centered devices, do have in mind that the price is going to be pretty high. For a few grand, you’re definitely getting a high-quality device. The interface feels very well built, it’s sturdy and all of the buttons and knobs feel premium and precise. The front of the Ensemble hosts 2 direct instrument inputs, with their own dedicated outputs below them. This means you can easily route the signal through the interface, while simultaneously sending it through the outputs to an amp. Selecting the actual input is done via 2 rows of buttons on the right of the 2 inputs, with handy OLED visualizers for both the input and output level. The levels are adjusted on the fly with 2 large knobs. The rest of the front panel is made simple, with only 4 assignable buttons, as well as 2 separate headphone outputs and level control for each of them. The Ensemble, while definitely a rack interface, is pretty petite but manages to house a myriad of extra connections. You basically have 10 digital inputs, and 20 mic preamps, with a combination of either mic only or combined instrument/mic inputs at your disposal. While all of the mentioned specs and features are pretty commonly found in other models, especially in this price range, it’s the integration with the Apple operating system and software packs that make the Ensemble stand out as a very reliable and overall professional audio engineering tool. ​If you already own an Apple computer, the high price tag of the Apogee Ensemble shouldn’t be too big of a problem, as it really gives you a professional environment for recording audio of any kind. Slightly more affordable than the Presonus, the Focusrite has everything you need to upgrade your amateur studio or replace your old interface. We’ve already seen how Focusrite focuses on beginner and advanced recording engineers and their needs. Their Clarett 8PreX audio interface targets professionals with amazing specs and features, both hardware and software-wise. Unlike the other rack mounter interfaces we’ve come across so far, the Clarett 8PreX takes up not one, but two rack slots. This is very important to have in mind, especially if you already have a lot of rack devices in your studio. This bad boy simply needs more space! The front hosts a pair of instrument inputs, as well as a full control layout for 6 channels individually. The right-hand side of the Clarett features an LED visualizer for 8 the 8 inputs, as well as the stereo output. The monitor level is adjusted via a big knob, and the 2 headphone output levels are controlled via the 2 smaller knobs. 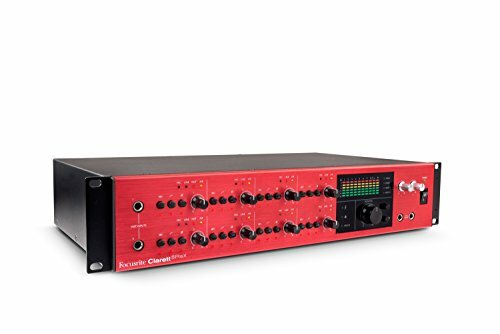 The slightly more robust dimensions of the Clarett 8PreX are due to the fact that Focusrite went with separate jack and XLR inputs instead of combined ones like you’d see on the 8Pre model. You basically have 8 pairs of XLR and instrument inputs on the back, alongside S/PDIF, dual optical inputs and outputs, MIDI I/O, as well as 10 analog outputs. As you’d expect from a professional-grade interface, you have 26 inputs and 28 outputs at your disposal at any given time. With the included software, as well as the ability to fully control the Clarett via an iOS device, this interface is an affordable alternative to the previously mentioned Apogee Ensemble. ​You can hardly find a better audio interface than the Clarett 8PreX in this price range, and for the needs this device caters to. More affordable than some of our other options and a ton of integration options make this a prefect option in the USB category. Having a very tight and stable integration with a DAW is one of the most important factors when it comes to audio recording. That’s where the Audiobox 1818VSL by PreSonus steps in, as one of the best USB audio interfaces on the market that’s still pretty affordable. While the 44VSL is definitely cheaper and scaled down, both in terms of features and the actual size, I chose the 1818VSL for this category, due to its expanded features and overall versatility. On the front, there are 8 combined instrument/mic inputs, with individual level knobs. As far as the visual feedback goes, there is only a “clip” LED for each channel, as well as left and right channel meters for the output. A single headphone output and separate phone and main level knobs are pretty much everything you’ll find on the front. The back hosts 10 analog outputs and MIDI, S/PDIF and ADAT I/O. This means you basically have a total of 18 inputs and 18 outputs, as the model name might already suggest. Having this many I/O options in a relatively medium-sized device in the mid-range price point (including the software you get) is a very good deal, no matter what you may want to record. 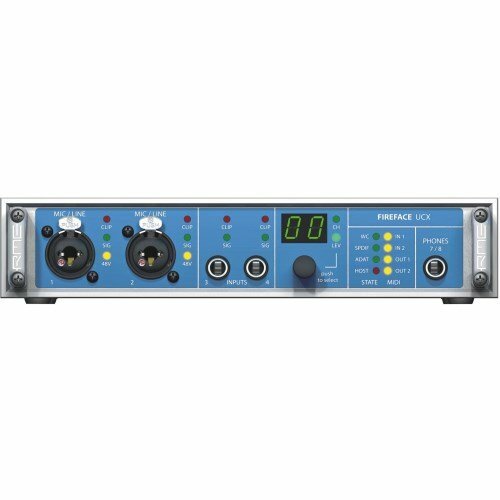 As you get 24bit/96kHz recording quality, you may want to look somewhere else if you need a professional audio interface. But then again, this is somewhat of a different category in the first place. The mentioned software includes Studio One 3 DAW, and loads of other, third-party resources, which should be more than enough for beginners, and probably more advanced sound engineers as well. ​The Audiobox 1818VSL by Presonus is a great choice for anyone looking for expanded connectivity and a consistent workflow without spending too much money. This is a great option for a sound engineer that is looking for a mobile option with plenty of functionality. So far we’ve only seen models coming from a couple of major brands. 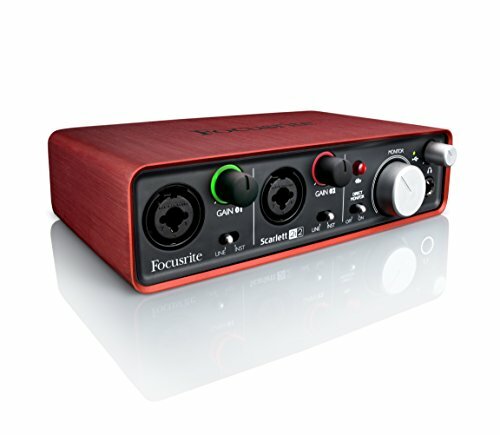 As the second audio interface of choice in this category, we have the Fireface UCX by RME, which offers a definitely unique approach to recording audio. While this interface looks like a plain old desktop model, it’s much more than that. The front hosts 2 combined inputs and 2 standard instrument ones, alongside a small screen with a selector knob for controlling the active inputs as well as the levels. Apart from that, there is only a headphone output on the far right. The back features 4 more balanced inputs and 6 balanced line outputs. ADAT optical connections and S/PDIF I/O are of course there as well, and MIDI I/O for extended connectivity. The truly convenient thing about the Fireface is that it can either be used via the USB or Firewire connection. While I did state that we were going to focus on USB and Thunderbolt interfaces only, the extra connection is still worth mentioning. So, why would you spend around over a grand for a device that offers, at first glance, fairly similar specs and features as the Audiobox 1818VSL? The Fireface UCX is perfect for studio use, but for live recordings as well. It doesn’t require being connected to a computer and offers full control over it via the MIDI connection. Basically, this interface is the go-to choice for any sound engineer looking for a mobile yet powerful device that can easily be used on stage as well as in the studio. ​So, if you need a bit more than just a regular old studio audio interface, definitely consider getting the Fireface UCX by RME. Capable of emulating different amps with great sound. If you need an amp with thunderbolt connectivity, you can't go wrong. And finally, in our last category, we have the Apollo Twin MKII Duo by Universal Audio. As it’s a Thunderbolt audio interface and is primarily meant for Apple computer users, it’s slightly more expensive than some alternative models with similar features. However, that doesn’t mean you don’t get high-quality performance. Unlike most other interfaces we’ve gone over so far, the Apollo Twin hosts its controls on the top of the device rather than on the front. There is only one big knob on the top followed by 8 buttons and an array of LEDs, which, depending on whether the device is in monitor or preamp mode, show different parameter levels. The front of the interface houses a single instrument input and a headphone output on the right-hand side. It’s the back where the rest of the I/O is tucked away, and it doesn’t disappoint. 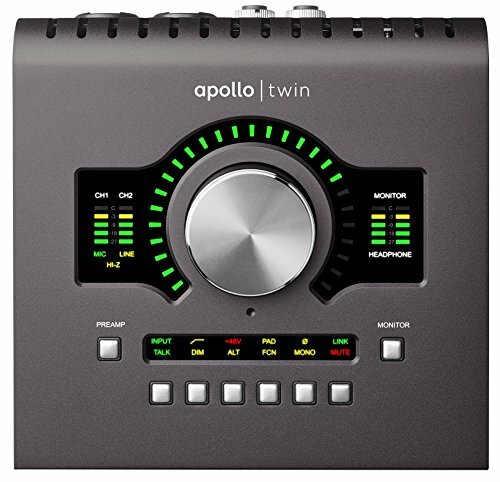 With 2 combined XLR/instrument inputs, 2 pairs of analog outputs and an optical input, it’s clear that the Apollo Twin is pretty compact yet very versatile. It can handle up to 3 analog and 8 digital channels, and output via the 2 pairs of analog connectors. It’s the actual processing that makes this interface really stand out, due to its Unison preamps, that are capable of adapting to various plugins, emulating different amps, EQ settings, valves, and other pieces of equipment with very high precision and natural sound. ​Sleek, simple, compact, yet powerful, the Apollo Twin MKII Duo by Universal Audio is a great addition to any recording studio, no matter what the actual needs are. Plenty of inputs and features with this low-latency thunderbolt option. And as the final model we’re reviewing, we have the Clarett 2Pre by Focusrite. This model is a compact yet feisty Thunderbolt audio interface solution for anyone looking for a reasonably priced and well-performing addition to their studio. 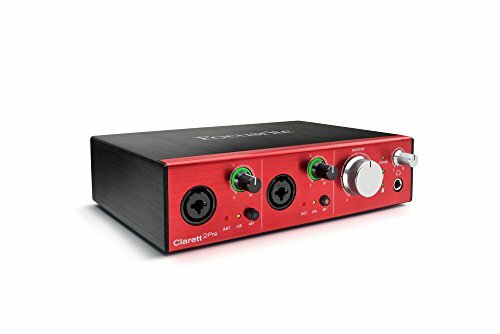 The Clarett 2Pre hosts only 2 combined inputs on the front, with separate level control, as well as the master monitor knob and a single headphone output. Once again, it’s the back of the device that gives you extra versatility and connectivity. Two pairs of analog outputs alongside MIDI I/O and optical input allow you to use this interface with pretty much anything else in your studio. The ADAT connection allows for up to 8 more channels, resulting in a total of 10 inputs. Unfortunately, the Clarett 2Pre needs external power, meaning it’s not that travel-friendly despite the very compact form factor. The accompanying software pack handles all of the inputs and outputs easily, and makes using the device a very pleasant experience, even for absolute beginners. Due to the fact that it connects via Thunderbolt, there is almost no lag, and latency is very low. Overall, a very stable and reliable audio interface with high-quality microphone preamps. ​If you plan on using this interface with a Windows computer don’t expect a flawless user experience you’d get on a Mac. All things said, the Clarett 2Pre is well worth the money! First things first, let’s see what exactly is an audio interface. It’s a device that bridges the gap between a microphone or an instrument and your computer. The signal that’s coming from an instrument is analog, and your computer deals with digital signals. Of course, plugging in a simple microphone into the mic input on your computer is still analog, but your motherboard converts that signal to a digital one at some point. As I’ve already explained, you could always just connect your instrument to your computer via the analog input you already have, but if you plan on doing anything more than just fiddling around with your guitar/mic, you will need a good audio interface. When does an audio interface come in handy? Basically, you can look at an audio interface as a standalone device that manages your audio, both the signals coming to your computer, as well as the ones that are coming out of the speakers or headphones. The fact that an audio interface sits outside of your laptop/desktop gives you a couple of advantages. First of all, managing more than one input or output device is much easier, as you can reach, plug and unplug any device you’re using at the moment. Second, the rest of the components inside your computer create interference. Having a built-in, or integrated, sound card definitely saves precious desk space but makes the signal prone to electromagnetic and radio interference, as well as latency. As most integrated sound cards offer either a stereo or, at best, a 7.1 connection in terms of output, and only a couple of inputs, you can’t really do much more than play games or watch movies. So, why do you need an audio interface? Any kind of audio recording, whether it’s just you making a simple song, or recording multiple instruments such as a whole drum kit at once, basically requires you to use an audio interface. Even recording vocals only, such as podcasts or video game streaming, is much easier and yields better results when an appropriate audio device is used. Luckily, there are many different models to choose from, both in terms of specs, features, and budget. The bottom line is: Whatever your case may be, an amateur and pretty simple home studio, or a professional-grade one, there is an audio interface that will do the job! Now that you’re sure that you actually need an audio interface, you need to have at least a rough idea of the specs and features you’re looking for. Once again, there are many different models on the market, each with a more or less unique approach to the whole ordeal, but you can’t always count on finding the perfect model for your exact needs. Here’s the setup: You connect your microphones and instruments to the audio interface. These connections are standardized, with the microphones utilizing the 3-pin XLR connectors, and the instruments using standard audio cables. However, when it comes to the computer – audio interface end, you can choose from a couple of different options. As one of the most commonly found type of connection, getting a USB audio interface can be very convenient. This means that you will be able to use your device with either a Mac or PC computer, as well as some other devices. All of the versions (1.1, 2.0, and 3.0) of this kind of connection allow you to power your device as well as transfer data through one single cable, eliminating clutter and tangles, as well as providing you with mobility. On the other hand, you can go with Thunderbolt, which may not be as versatile as USB, but gives you certain advantages nonetheless. Depending on the version of the connection, you can get data transfer speeds that are up to 8 times faster than USB 3.0. It’s because of this that more and more audio engineers look at this type of connection as the new industry and reference standard when it comes to working with audio. However, do have in mind that using a PC with Thunderbolt devices requires not only the appropriate port but motherboard compatibility as well. As Apple desktops and laptops seem to be the devices of choice for not only visual but audio engineers and artists, consider using this platform if you don’t already have a good PC, and have enough money to spend on it altogether. Firewire was once a standard when it came to connecting audio and visual devices to your computer. However, with the development of faster protocols regarding USB and Thunderbolt, it soon became relatively obsolete. PCIe is the same connection as the one that your graphics card uses in your desktop, but generally speaking, is not as convenient for everyday use when it comes to audio interfaces and everyday recording sessions. Because of these reasons, I will only focus on USB and Thunderbolt audio interfaces in the rest of this article! Now that you’re sure that you can connect the audio interface to your computer, you need to decide on the form factor of the actual device. While audio interfaces come in all sorts of sizes (the shape is more or less standardized), they can get pretty big. The two most common form factors you will find are the desktop and rack interfaces. Desktop interfaces are generally pretty small and don’t take up too much space. For the purposes of a home recording studio, this form factor is probably your best choice. You can put the interface on your computer case or simply under your monitor. Just make sure that you count in an extra inch or two for the cables coming from the back and front of the device. Rack interfaces, on the other hand, are mostly focused towards professionals who already have other rack devices in their studio. These devices are pretty slim but tend to be much wider than the desktop ones. This way, you can store multiple rack devices inside, well, a rack. By doing this, you have a bunch of different devices stacked one on top of the other, not taking up space on your desk. As these sport a wider form factor, they usually have more inputs and outputs than your standard desk interfaces. The most important difference between various models of audio interfaces is the actual number of inputs and outputs they provide. So, how many do you need? Ask yourself what are you going to record the most? Is it going to be just an instrument, an instrument and a microphone, or multiple instruments at the same time? Depending on the number of inputs you plan on using at the same time, certain models are more practical than others. A general rule of thumb is to get one or two extra inputs than you originally plan on using. This way, you will be able to utilize your interface in any unforeseen circumstances you may find yourself. Most smaller models tend to use inputs which combine standard instrument inputs as well as XLR ones for the microphones. While this definitely saves precious space, do have in mind that if the specs sheet states, for example, that there are 2 combined inputs, this means you can only use 2 input devices at the same time. Basically, 2 instruments, 2 mics or an instrument and a microphone simultaneously. So, the sheets may say that there are 2 instrument and 2 microphone inputs, and that is true, however, you can only use 2 inputs at the same time! A quick and easy way to make sure you got the specs right is by simply looking at a photo of the interface. Oh, and don’t forget that condenser microphones require preamps with phantom power, so if you plan on using those, make sure that the interface supports that feature, and can deliver that extra juice! If you’re an absolute beginner, chances are that you’re not going to need any digital inputs. However, they can be very convenient once you start recording multiple channels at once, such as drum kits. Digital inputs allow you to connect, for example, a microphone preamp with multiple devices connected to it, via just one connection. This means that all of your other, analog, inputs will remain free and ready to take up other devices. This feature easily turns a small and compact interface to a very powerful one, albeit with an additional device needed. As far as outputs go, you will most likely only need a pair of stereo outputs to hook up to your studio monitor speakers, unless you’re routing the audio to more than one device simultaneously. A headphone output is a necessity as well. Personally, I prefer a front-facing output, as you can easily reach and disconnect your headphones when needed. Some models, however, feature the connection on the back of the device. The interface, or the front of the device, is what you’ll be seeing and using most of the time. While the back of the device hosts most of the connections, all of the most important parameters are controlled via knobs and buttons on the front. The basic controls include the master (output) level, separate channel levels, and other parameters such as headphone level. Separate channel LED lighting is a handy little feature that’s worth checking out. By having a visual feedback of the levels on the individual channels, you can easily tell if the signal is clipping or not. The rest of the features you can expect vary from model to model, so by comparing different ones, you can get a better image of what you may find more practical. In the reviews part of the article, I’ll make sure to include as many unique and different features as there are, and point out how and when they come in handy. If you’re already familiar with studio equipment, you might have already known most of the things we’ve covered so far. However, now we’re going to take a closer look at some of the most important specs various audio interface models have to offer, in terms of the actual quality of the recordings you get. So, if you find an audio interface that offers a bit depth of 16, this means you will get a dynamic range of 96dB. While 96dB is considered as an audio CD standard, the overall range is relatively small. Recording-wise, the quiet parts of your tracks will be pretty noisy. The safest way to go is 24 bits. This gives you a dynamic range of 144dB, meaning your recordings will reach much higher quality levels. This is also considered the professional standard. A sample is a portion of the captured audio. A sample rate is then, the number of captured samples that the interface is capable of handling in 1 second. Knowing that, it’s clear that a 44.1kHz sample rate (CD standard) means you get 44,100 “pieces of audio information” each second. While the human ear can only pick up frequencies up to 20kHz, you may think that anything above that is unnecessary. However, due to the nature of recordings, and the technology that is being used for capturing and reproducing sound, some models go even up to 96 or 192kHz. So, what’s the bottom line? What should you look for specs-wise? It pretty much depends on what you plan on doing with the finished recording. CDs and .mp3 files will sound more than decent at 16-bit/44.1kHz. Slightly above that, with 24-bit/96kHz recordings, you will meet the expectations of most audiophiles, looking for more clarity and overall a higher audio quality level. Anything above that, you’re looking at movie-grade audio that’s definitely overkill if you plan on simply recording songs. Oh, and don’t forget that the higher the numbers are when it comes to bit depth and sample rate, the more disk space you’ll need, as the files can get pretty big pretty quickly! One final factor that’s very important when it comes to the signal and recording quality is the actual quality of the digital converter inside the interface. If the converter is not up to the task, all of the previously mentioned numbers and values simply don’t matter anymore. While most if not all audio interfaces come with at least some software or full DAW, it’s important to check which program pack you get. Not all DAWs are meant to be used by beginners, as some tend to be too advanced and confusing for anyone without previous experience. As far as actual DAW compatibility goes, checking out if the model you plan on getting is compatible with the DAW of your choice is generally a smart move. Transitioning from one platform to another can be pretty hard and time-consuming, which is important to have on your mind, especially if you run a recording studio that has a lot of artists and bands coming often! Well, that pretty much wraps this article. We’ve gone over the most important specs and features a good audio interface should have, as well as the best models in different categories currently on the market. What was your favorite? Did you find the perfect audio interface for your needs? I sincerely hope that you learned something new on this topic, and that reading this article helped you in choosing your next audio interface for your studio. This was an interesting read but not useful. It states personal opinion, no scientific measurements as to why one audio interface wins its class. Focusrite is frequently recommended but no review I have seen clearly states why they choose it over a Behringer costing less than half and more features. I do not yet own either but I am researching to buy. I was first attracted by the shiny red Focusrite, as I am sure most reviewers are. But after watching many YouTube reviews I am now not so sure. It seems Behringer performs just as well as Focusrite, is audibly as good, has more features and costs less than half. What is going on? Thanks for checking out our guide, John. You are absolutely right that in a lot of cases personal preference is going to come into the equation. We do our best to share thoughts and opinions from other musicians so that people looking for products have the best shot at finding something that is great. Let us know what you ended up choosing and how it has worked out! Very good article! As a low voltage tech. (17years) this article taught a an excellent way of answering questions to various clients ranging in very knowledgeable to just learning. I also learned a few tech. tips. Thank you very much.